Chesire Ohio (Eve Morgenstern, US, 2017) will be screened as part of the 2018 Fingerlakes Film Festival (FLEFF) . A gun toting 83-year old woman refuses to sell her house to the power plant next door. But despite her refusal, the plant has moved ahead with their 20 million dollar deal to buy out most of Cheshire and bulldoze all the homes. What happened in this Ohio River town overrun by one of the largest coal-fired power plants in the world? A story of money, power and the increasingly difficult choices we face surrounding coal and the environment, Cheshire, Ohio makes us think twice about home. 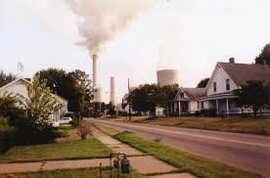 Filmed over a decade, Cheshire, Ohio follows a community devastated by coal, starting with American Electric Power’s buyout and bulldozing of this Ohio River community after exposing them to years of harmful emissions. As the cycle of pollution from coal continues, we see how one town suffers from our reliance on carbon energy.